A second prestigious hilltop temple – Wat Phra That Khao Noi -- lies just outside town, though in this case the hill is higher than at Wat Phra That Chae Haeng and the views correspondingly more spectacular. 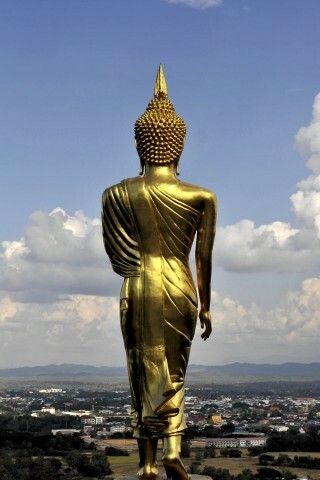 In fact, the view of Nan town with a nine-metre golden walking Buddha image in the foreground is something of an iconic Nan image and features in many of its tourist brochures and posters. The temple itself, dating to the late 15th century and accompanying chedi housing – you guessed it – more Buddha relics are attractive but unspectacular; you go for the view. The wat faces due east so dawn is ideal though late afternoon with the sun shining back on the town and valley is also a good time to stop by. Last updated on 10th September, 2016. Head south past Nan bus station on Route 101 and take the first right turn. From here Wat Phra That Khao Noi is well signposted.